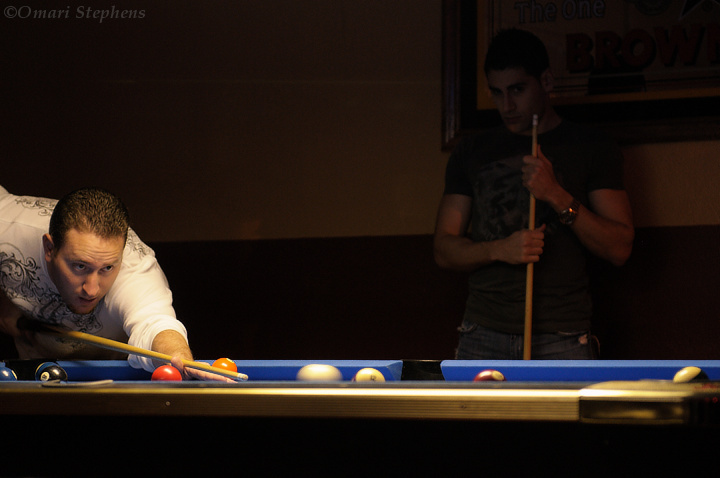 Near the end of a very busy Friday, I encountered a serendipitous opportunity to shoot some pool, in a sense. Inspired by some shots from my friend Brandon this past week, I tried to focus on capturing the motion of the game while still keeping the faces sharp. In the 15 minutes that followed, I ended up shooting the two best pool photos I've ever taken. The shot above is at least 75% luck. I also learned empirically that DSLR shutter lag — the delay between when you fully press the shutter release and when the camera starts recording the image — is perceptible, if barely. On a few occasions, I predicted the final stroke, hit the shutter release, and thought "man! too early!" One of those times, I recall the viewfinder blacking out as the cue was about to hit the cue ball, and the ball was halfway across the table in the actual capture. The leading photo was my second pool shot of the night, and this was my second-to-last. This guy was using more finesse than the one shooting the break, so he stayed fairly still after hitting the ball, which kept him nice and sharp. I didn't (consciously) notice his opponent in the background, but I'm glad he's there. 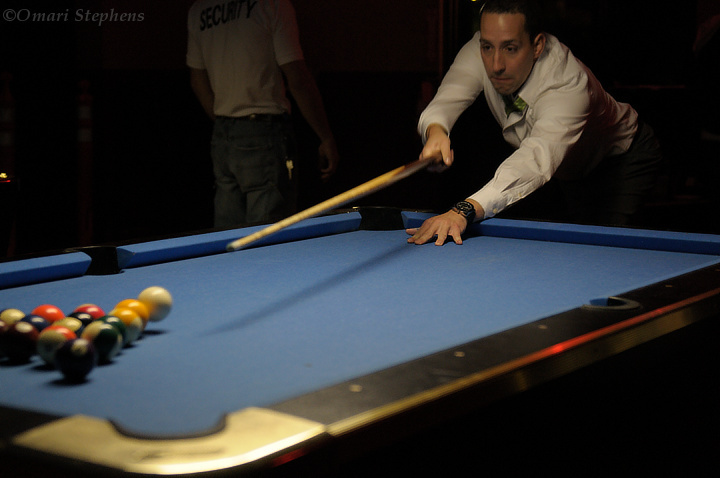 Seeing him eying the corner pocket, with his hands clasped on his pool cue, adds a lot of depth to the image — this is a competition, not just some guy working on his corner shot. Finally, I'm still puzzling out what the future of this blog might look like. Even so, I'm still shooting a lot and have lately been posting photos to both Twitter (@doppler_fto) and Facebook. That said, the two sites have different strengths and weaknesses, so the content on the two might diverge a bit over time; I don't really know yet. Right before impact! I'm really impressed how the cue ball in the first photo is clearly floating. It's actually right after the impact, which is why the cueball is in midair (probably had a lot of topspin). You can also see that the balls at the back are starting to separate, even though the front balls are still pretty tightly packed. I only notice the separation now that you mention it. Thanks for the links! Is it supposed to link there? The second photo goes to the right zenfolio photo.